As the U.S. population becomes more racially and ethnically diverse, Americans have mixed views about how the country might change when blacks, Hispanics, Asians and other minorities make up a majority of the population. While more say this change will be good for the country than say it will be bad, the predominant view is that it will be neither. At the same time, when asked about projections by the U.S. Census Bureau that a majority of the U.S. population will be nonwhite by the year 2050, about half of Americans say this shift will lead to more conflicts between racial and ethnic groups. And about four-in-ten predict that a majority nonwhite population will weaken American customs and values, larger than the shares who say it will strengthen them (30%) or will not have much of an impact (31%). Opinions about the growth in interracial marriage are, on balance, positive or neutral. About half say more people of different races marrying each other than in the past is a somewhat or very good thing for the country, while about one-in-ten say it’s a somewhat or very bad thing, and four-in-ten see this as neither good nor bad. On this question, as well as the questions about the impact of having a majority nonwhite population, Democrats and those who lean Democratic express far more positive views than Republicans and Republican leaners. The survey also asked about trends related to marriage and divorce. About half of Americans (53%) predict that in 30 years people will be less likely to get married than they are now; just 7% say people will be more likely to get married, and 39% say people will be about as likely to marry. About six-in-ten expect the divorce rate to remain about the same, but 29% say people who are married will be more likely to get divorced than people are now; 12% say married people will be less likely to divorce. According to the U.S. Census Bureau, blacks, Asians, Hispanics and other racial minorities will make up a majority of the population by the year 2050. When asked about the impact this change will have on the country, about a third of adults say this will be either very (17%) or somewhat (18%) good, about a quarter say it will be very (15%) or somewhat (8%) bad, and 42% say this change will be neither good nor bad. Nonwhites are about twice as likely as whites to say having a majority nonwhite population will be good for the country: 51% of all nonwhite adults – including 53% of blacks and 55% of Hispanics – say this, compared with 26% of whites. About three-in-ten whites (28%) say this change will be bad for the country, while 46% say it will be neither good nor bad. Views also differ by age. Young adults are more likely than their older counterparts to say a shift toward a majority nonwhite population will benefit the country: 50% of adults younger than 30 hold this view, compared with 36% of those ages 30 to 49, 29% of those 50 to 64, and a quarter of adults ages 65 and older. These differences reflect, in part, the fact that the younger group is more racially and ethnically diverse than the older groups. Age differences in views of this projected demographic change are more modest among whites. Views about the impact of having a majority nonwhite population also vary considerably by party. Among Democrats and Democratic-leaning independents, half say this change will have a positive impact on the country, while 37% say it will be neither positive nor negative, and just 12% say it will have a negative impact. By contrast, a larger share of Republicans and Republican leaners say this will be bad for the country (37%) than say it will be good (16%), while 47% say it will be neither good nor bad. These partisan differences hold up even after accounting for respondents’ race and ethnicity. While most Americans say a majority nonwhite population will have a positive or neutral impact on the country, more say this shift will lead to more conflicts between racial and ethnic groups (49%) than say it will lead to fewer conflicts (26%). And more say this will weaken American customs and values (38%) than say it will strengthen them (30%). Consistent with their more negative assessments of the overall impact of this demographic change, whites are more likely than nonwhites to say having a majority nonwhite population will lead to more racial and ethnic conflicts (53% vs. 43%) and that it will weaken American customs and values (46% vs. 24%). Among Republicans, about six-in-ten say having a majority nonwhite population will lead to more conflicts between racial and ethnic groups and that it will weaken American customs and values (59% say each will happen). Democrats are more divided in these assessments. About four-in-ten Democrats (42%) say this will lead to more racial and ethnic conflicts, 36% say it will lead to fewer conflicts and 22% say it won’t have much of an impact. And while 42% of Democrats say having a majority nonwhite population will strengthen American customs and values, sizable shares say it will weaken them (22%) or not have much of an impact (33%). About half of Americans say it’s either a very (30%) or somewhat (19%) good thing that a larger share of people of different races are marrying each other than in the past; about one-in-ten (11%) say this is a bad thing, and four-in-ten say it’s neither good nor bad. Views on this question don’t vary considerably across racial and ethnic groups. A majority of adults younger than 30 (58%) see the increase in interracial marriages positively. Among the older groups, 51% of those ages 30 to 49, 45% of those ages 50 to 64, and 40% of those 65 and older agree. About four-in-ten in each of the three groups say this is neither good nor bad, while relatively few see it as a bad thing. Views also vary by educational attainment and party identification. Nearly two-thirds of adults with a postgraduate degree (65%) say the rise in interracial marriage is a good thing for the country, compared with 55% of those with a bachelor’s degree, 49% of those with some college education and 40% of adults with a high school diploma or less education. Among Democrats and Democratic-leaning independents, about six-in-ten (61%) say it’s a good thing that more people of different races are marrying each other, and this is particularly the case among those who describe their political views as liberal. About three-quarters of liberal Democrats (73%) say this is a good thing, compared with 51% of their moderate or conservative counterparts. Just 7% of all Democrats and Democratic leaners consider the rise in interracial marriage to be a bad thing, and 31% say it’s neither good nor bad. Republicans and Republican-leaning independents are less likely than Democrats to see the increase in interracial marriages in a positive way: 33% say this is a somewhat or very good thing, while 16% see this as a somewhat or very bad thing, and half say it’s neither good nor bad. There are no significant differences in the views of Republicans who consider themselves conservative and those who say they are moderate or liberal. Despite a longer-term downward trend, the share of U.S. adults who are married has been relatively stable in recent years. But about half of Americans expect that to change, with 53% saying that people will be less likely to get married in 2050 than they are now. Just 7% say people will be more likely to get married, while 39% expect no significant change. For the most part, views on the future of marriage don’t vary much across demographic groups, but higher shares of those who are currently married (57%) than those who are not married (48%) expect marriage to be less common by 2050. And while 56% of whites and 53% of Hispanics expect that people will be less likely to get married in 2050 than they are now, just about a third of black adults (34%) say the same. 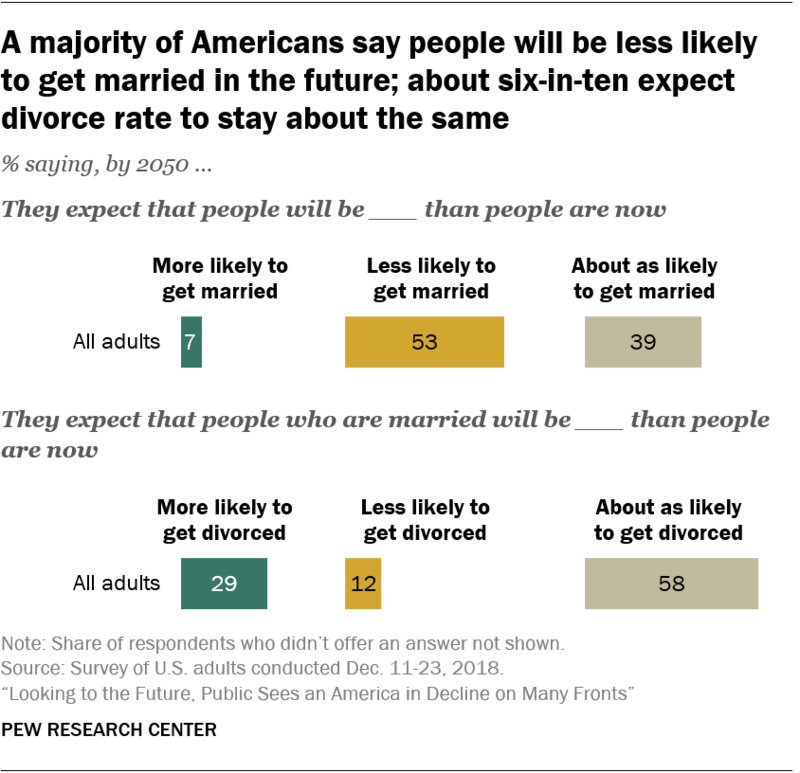 For the most part, Americans expect the divorce rate to stay largely unchanged: 58% think married couples will be about as likely to get divorced by 2050 as they are now. But a sizable share (29%) think people who are married will be more likely to get divorced in another 30 years; 12% think divorce will be less common by then. Married and unmarried people have similar views on the future of divorce. 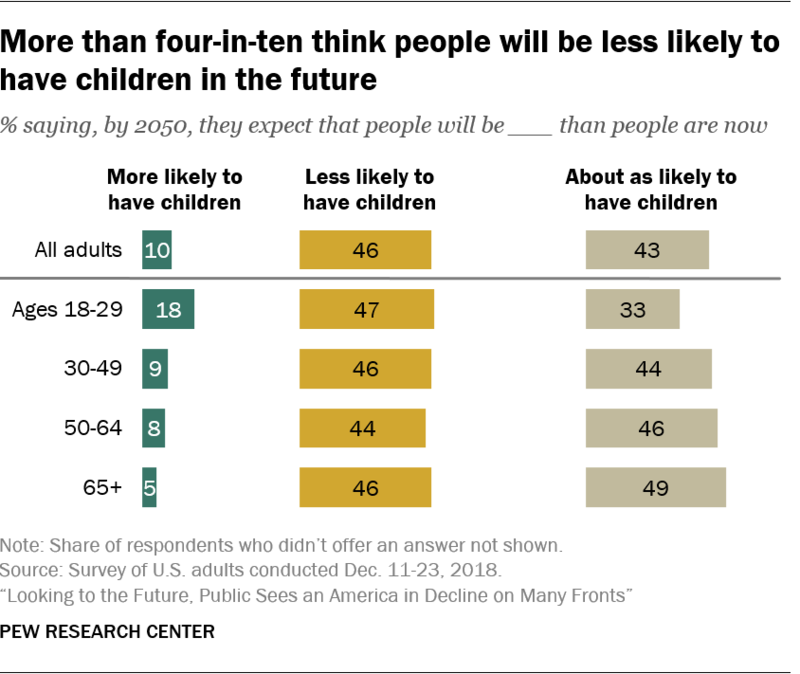 More than four-in-ten Americans (46%) expect that, by 2050, people will be less likely to have children than they are now. A similar share (43%) think people will be about as likely to have children, while just one-in-ten expect people to be more likely to have children in the future. 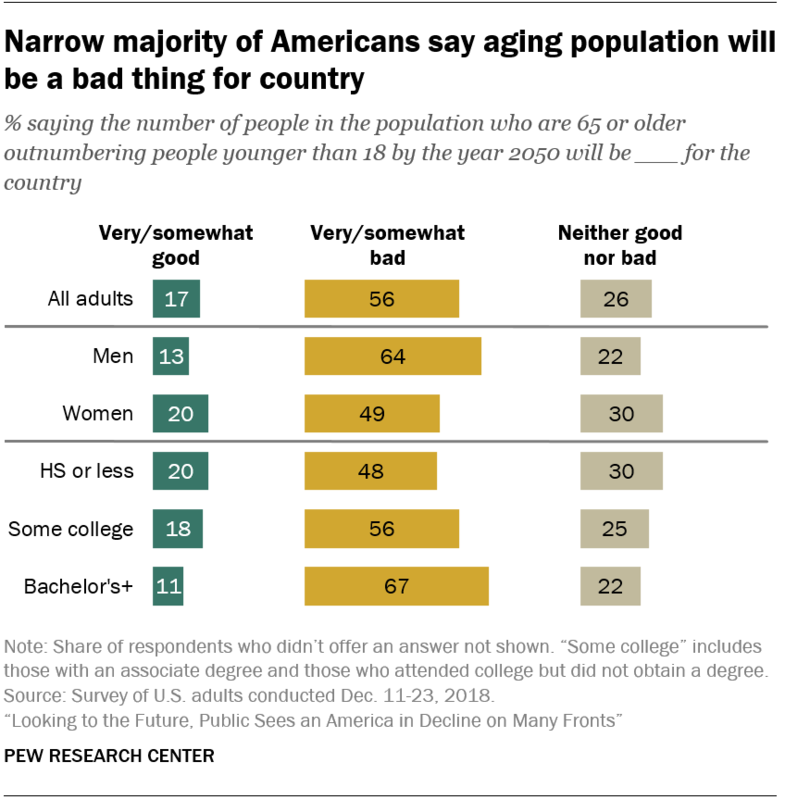 While a minority across all age groups expect that people in 2050 will be more likely to have children, young adults are more likely than older Americans to say this is the case. About one-in-five adults younger than 30 (18%) say they expect that people in 2050 will be more likely to have children, compared with 9% of adults 30 to 49, 8% of adults 50 to 64 and 5% of those 65 and older. The U.S. Census Bureau estimates that, by 2050, the number of people who are 65 and older will outnumber those younger than 18. A majority of the public (56%) say this transformation will be a somewhat or very bad thing for the country, 17% say it will be good and 26% say it will be neither good nor bad. Adults with more education are more likely than those with less formal schooling to see population aging negatively. About two-thirds of those with a bachelor’s degree or more education (67%) say this will have an adverse impact on the country, compared with 56% of those with some college and 48% of high school graduates and those with less education. Views about the impact of population aging also vary considerably by gender. Men are far more likely than women to say this change will be bad for the country (64% vs. 49%), while 20% of women – vs. 13% of men – say this trend will have a positive impact. Views don’t vary considerably by age, race and ethnicity, or party identification.